It is unsurprising that Saturday’s Giro stage over the Gavia has rekindled memories of the epic stage to Bormio twenty years ago. Facts are hard to come by but for me one thing is clear, the hero of the day was Johan Van der Velde. Is it possible to be a hero and a lunatic at the same time? 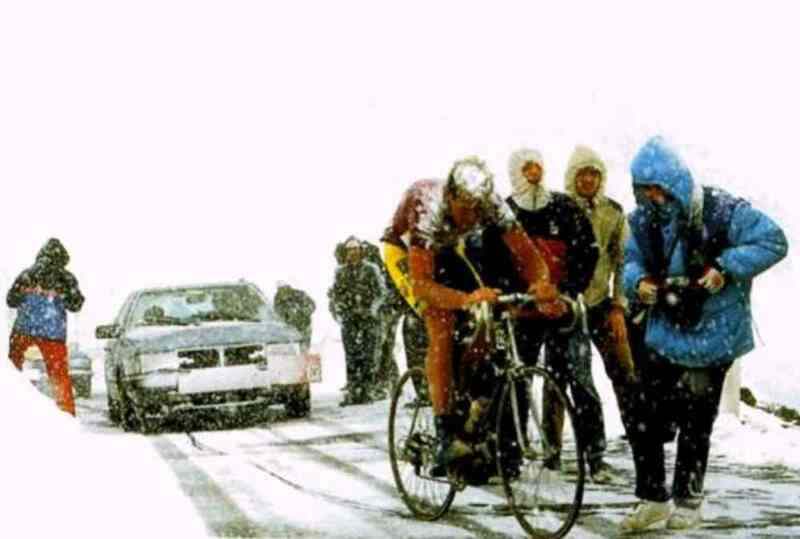 I think so, why else did Johan attack the climb in a blizzard wearing a short sleeve jersey, no hat or gloves nor even track mitts. For the record Van der Velde was first to the summit at 2652 metres. Eric Breukink caught Hampsten on the descent and took the stage win at Bormio. Hampsten took the pink jersey and held it to the end thereby creating the myth that he is the hero of the Gavia 88. Per your request, this letter is to confirm I am willing to assist you in providing UK Sport and others with information that will help them to improve the effectiveness of their anti-doping programs. The specific details regarding how you were able to circumvent the British and IAAF anti-doping tests for an extended period of time are provided below. Your performance enhancing drug program included the following seven prohibited substances: THG, testosterone/epitestosterone cream, EPO (Procrit), HGH (Serostim), insulin (Humalog), modafinil (Provigil) and liothryonine, which is a synthetic form of the T3 thyroid hormone (Cytomel). Testosterone/epitestosterone cream was also primarily used during the off season. It was rubbed into the skin on the front of the forearm two days per week, typically Tuesdays and Thursdays. The dosage was ½ gram which contained 50mg of testosterone and 2.5mg of epitestosterone (20 to 1 ratio). The purpose was to offset the suppression of endogenous testosterone caused by the use of the THG and to accelerate recovery. The testosterone/epitestosterone cream was also used in cycles of three weeks on and one week off. HGH was used three nights per week, typically on Mondays, Wednesdays and Fridays. Each injection would contain 4.5 units of growth hormone. Once again, this substance was used primarily during the off season to help with recovery from very strenuous weight training sessions. Insulin was used after strenuous weight training sessions during the off season. Three units of Humalog (fast-acting insulin) were injected immediately after the workout sessions together with a powdered drink that contained 30 grams of dextrose, 30 grams of whey protein isolates and 3 grams of creatine. The purpose was to quickly replenish glycogen, resynthesize ATP and promote protein synthesis and muscle growth. Insulin acts as a “shuttle system” in the transport of glucose and branch chain amino acids. There is no test available for insulin at this time. Modafinil was used as a “wakefulness promoting” agent before competitions. The purpose was to decrease fatigue and enhance mental alertness and reaction time. A 200mg tablet was consumed one hour before competition. Liothryonine was used help accelerate the basic metabolic rate before competitions. The purpose was to reduce sluggishness and increase quickness. Two 25mg tablets were taken one hour before competition. There is no test available for liothryonine at this time. In general terms, explosive strength athletes, such as sprinters, use anabolic steroids, growth hormone, insulin and EPO during the off season. They use these drugs in conjunction with an intense weight training program, which helps to develop a strength base that will serve them throughout the competitive season. Speed work is done just prior to the start of the competitive season. It is important to understand it is not really necessary for athletes to have access to designer anabolic steroids such as THG. They can simply use fast-acting testosterone (oral as well as creams and gels) and still easily avoid the testers. For example, oral testosterone will clear the system in less than a week and testosterone creams and gels will clear even faster. Many drug-tested athletes use what I call the “duck and dodge” technique. Several journalists in the UK have recently referred to it as the “duck and dive” technique. This is basically how it works. Most athletes are tested approximately two times each year on a random out-of -competition basis. If a tester shows up and the athlete is not where they are supposed to be, then the athlete will receive a “missed test”. This is the equivalent to receiving “strike one” when up to bat in a baseball game. The current anti-doping rules allow an athlete to have two missed tests in any given eighteen-month period without a penalty or consequence. So, the disadvantage for an athlete having a missed test is that they have one strike against them. The advantage of that missed test is the athlete has now received the benefit of a cycle of steroids. Long story short, an athlete can continue to duck and dive until they have two missed tests, which basically means that they can continue to use drugs until that time. In summary, it’s my opinion that more than fifty percent of the drug tests performed each year should be during the off season or the fourth quarter. This is when the track athletes are duckin’ and divin’ and using anabolic steroids and other drugs. Let me provide some rather startling information for your consideration. If you check the testing statistics on the USADA website, you will find that the number of out-of-competition drug tests performed during each quarter of 2007 are as follows: in the first quarter there were 1208, second quarter 1295, third quarter 1141 and in the fourth quarter there were only 642. In late 2003 I advised USADA about the importance of random testing during the fourth quarter of the year. They did initially seem to follow my advice because they increased the number of fourth-quarter tests in 2004, 2005 and 2006. However, they failed to continue this practice in 2007. Why would USADA decide to perform only 15% of their annual out-of-competition tests during the fourth quarter? Let’s not forget that this is the off season before the upcoming summer Olympic Games. This is equivalent to a fisherman knowing that the fish are ready to bite and then consciously deciding that it is time to reel in his line and hook, lean his fishing pole up against a tree and take a nap. On several occasions, I have provided detailed information to both USADA and WADA in an attempt to help them establish more effective testing policies and procedures. I certainly have more information that I would like the opportunity to provide to you and UK Sport, but I will leave that for another time. Hopefully, this information will be helpful and I am available to assist you further upon request. Nicholas Roche won the first stage of the GP Internacional Paredes Roda do Moveis in Portugal yesterday in a mass sprint. 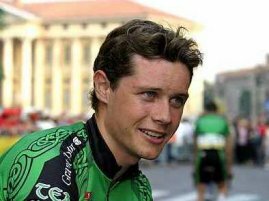 Roche, the twenty three year old son of TDF winner Stephen, beat fellow Credit Agricole rider Jeremy Hunt to the line. The win gave Roche the race lead with a four second advantage going into the second of four stages, as well as an automatic place at the Olympic games in Beijing later this year. He also picked up enough points through the stage to lead the points classification. Thanks to Roche’s and Hunt’s efforts Credit Agricole also lead the team classification. 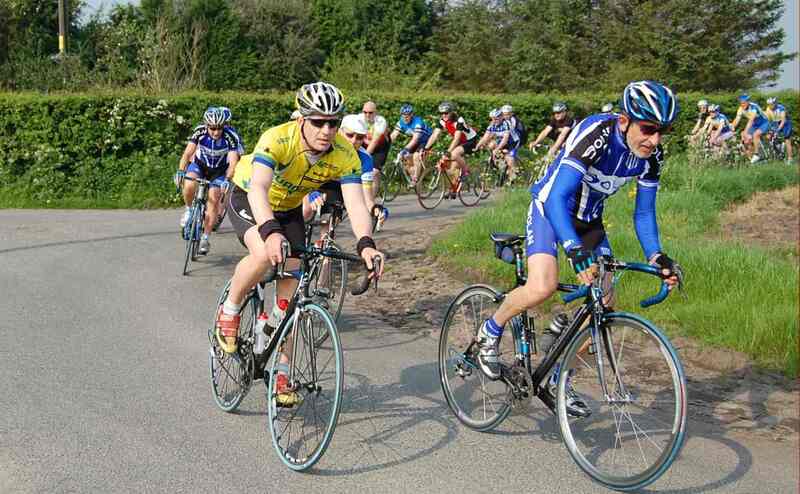 Last Sunday the Merseyside Wheelers promoted the twelth A day in Lancashire tourist trial over 74 miles. The photo shows Ricardo Garcia, Liverpool Mercury leading with Southport’s Mark Wilson following. Behind is the Mercury’s Phil Thomas. In the fifty years that I have followed bike racing I have never been influenced by nationalism. From Ercole Baldini onwards it has been the rider not the country that mattered. No longer, I now get an extra buzz everytime Cav wins because he is a Brit. In fact in cycling terms he is English because the Isle of Man was in my day part of the BCF Merseyside division and when Cav speaks that doesn’t seem surprising at all. Best of all, better even that him keeping on stuffing McEwan is the sheer joy he shows when he wins. It is infectious stuff. You don’t have to be as cynical as greenjersey to wonder about Petacchi’s explanation of his failed dope test in last year’s Giro. Petacchi told the CAS that he took two puffs from his inhaler before the stage, two more during the race and two or three after the finish. As he won the stage he was, of course, tested. The resulting urine sample was tested at the WADA laboratory in Rome and three days later the lab issued its finding that the sample contained 1352 ng/ml Salbutamol. The legal limit is 1000 ng/ml for riders with a certificate. If Petacchi’s explanation is true he deserves his suspension if not for doping for being the biggest clown on two wheels. Taking “two or three” puffs of his inhaler before the dope test is as daft as a drunk driver having a couple of swigs from his hip flask while waiting for the breathaliser test! It’s a great shame as I am a big fan of Ale-jet. I love his clean sprinting and the high speed of the Milram train makes it harder for McEwan to barge his way to the front, and I’m sure we all think that is a good thing.